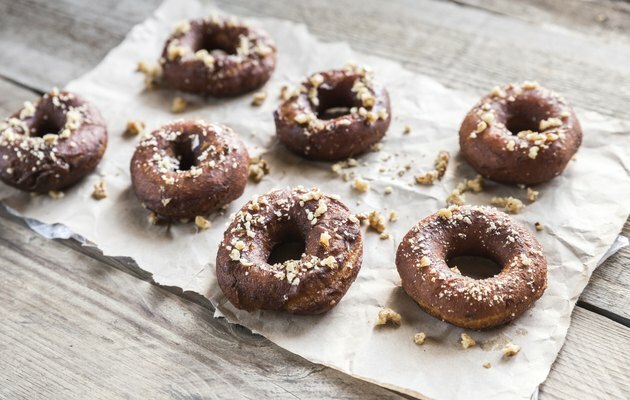 Homemade donuts let you bring this favorite treat home, and if you skip the fryer in favor of the oven, you can keep the fat and calories under control. While specialty doughnut pans are available, you can make donuts in your favorite flavors in the oven on a standard cookie sheet without any special equipment. All donuts fall into one of two basic types. Cake donuts are made with a cake-type batter, leavened with eggs and baking powder. This batter is relatively thin, and must be baked in a donuts-shaped pan to make traditional donuts. Yeast donuts rely upon a yeast dough. This dough can be rolled out and cut with round cookie cutters to form regular, neat donuts without any special equipment or pans. You can make yeast donuts dough by hand, in a stand mixer or with your bread machine. Combine 1/4 cup warm milk with one packet of active dry yeast and 2/3 cup sugar. Allow this mixture to rest briefly. Stir in one additional cup of warm milk, 2 tbsp. melted butter and two beaten eggs. Work five cups of flour, 1 tsp. of salt and a pinch of freshly grated nutmeg or cinnamon into the dough. Knead by hand, in the bread machine or your stand mixer until you have a soft, smooth dough. Place the kneaded dough into an oiled bowl, cover loosely and set in a warm place to rise for one hour, or until doubled in size. If you're using a bread machine, allow the dough to rise through the dough setting on the machine. Roll the dough 1/2-inch thick with a rolling pin on a floured surface, then cut circles with a 2-inch to 3-inch circular cookie cutter. Transfer the circles to a cookie sheet, then cut the centers with a smaller cutter if desired. Cover the donuts loosely with plastic wrap or a clean kitchen towel and leave to rise for 45 minutes to one hour. Bake in a preheated 375 degree Fahrenheit oven for 8 to 10 minutes. Remove the donuts from the oven when the bottoms are just turning golden brown. Dip the donuts in melted butter and coat with cinnamon sugar, glaze with a mixture of powdered sugar, milk and vanilla extract, or make a simple chocolate glaze by combining semi-sweet chocolate and heavy whipping cream.